The sisters’ journey to Mayo Clinic’s Rochester campus can be traced back to their father’s “struggle with polycystic kidney disease,” as they tell it. Lori remembers watching her dad “suffer through dialysis,” then seeing her mother, Jane McMillan, donate a kidney to him. In 2010, doctors confirmed Lori’s “worst fears” and diagnosed her with polycystic kidney disease as well. As her kidney function declined, it became clear Lori would also need a transplant or face dialysis. Family and friends were tested to see if they could donate. One by one, they were ruled out because “no one was a close enough match.” Then Mary got a call from the transplant team at Mayo. She was a perfect match. 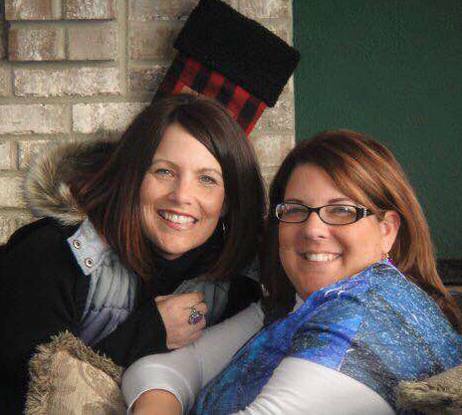 Mary McMillan Rivera and Lori McMillan Depauw. Recovery has gone well, too. Mary’s was much quicker than her mother’s was back in 1990, when kidney transplant was a new surgery, and a hard one for the donor, they say. Jane tells WTVO-TV that surgeons “removed two ribs from my back,” leaving “a really long scar.” Thanks to medical advances, kidney donation is now a much less invasive procedure, according to Mikel Prieto, M.D., a transplant surgeon at Mayo Clinic, which performs more transplants than any other medical center. Dr. Prieto tells the station he and his colleagues now use narrow laparoscopic instruments, which require just a small incision. For donors, that means “recovery is a lot better than it used to be,” he says. That was the case for Mary, who was back to work within a month of the surgery. Recovery will take a bit longer for Lori, a sergeant with the Loves Park Police Department in Illinois. But she tells the station she’s feeling “absolutely wonderful” and “like a whole new person.” She’s grateful to her sister for giving her that gift, and feels “so much closer” to Mary since the surgery. “There’s a different kind of connection now,” she says. You can connect with us by sharing your comments below. Then, share this story with others using the social media tools atop this page. .
What a wonderful story! My family had a similar situation, although I was too young to recall the details. My mom gave my uncle a kidney and I believe they’re coming up on 25 years this Spring. My uncle is still alive and well. I truly believe the greatest gift anyone can give, is the gift of life. Thanks for sharing this inspiring story!